We hear you scream—don't tell us so again! "This well-known and agreeable luxury is particularly acceptable during the hot sultry weather in July and August; indeed it is esteemed by many as a desirable luxury at all seasons. Besides the numerous confectionaries and gardens where it is sold, and which are much patronised by citizens in the summer evenings, some who are not particular as to the quality of this article, are supplied by colored men who take it round the city in covered pails. Gardens where Ice Cream is sold, have been known in this city for at least half a century. Much of the Ice Cream, however, sold in this city, is in truth Ice Milk merely; which shows the difficulty of obtaining cream. How seldom is it that a New Yorker enjoys that luxury in either tea or coffee!" 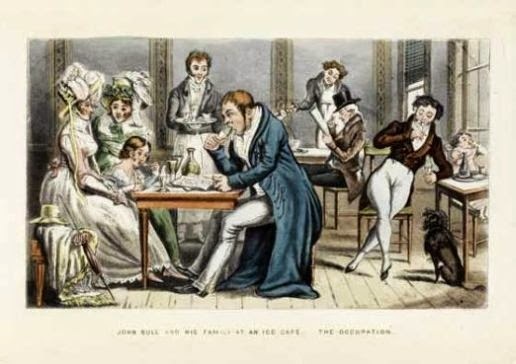 The basket he is carrying holds glasses and one spoon, which are seen in use in this print of an ice cafe from Regency England. The glasses are deceptive…the indent is only at the very top with the rest filled in. 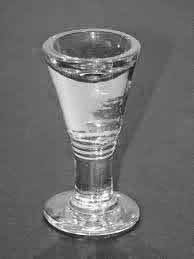 During the Victorian era before disposable bowls or ice cream cones, 'penny lick' glasses were used, and reused, by street vendors. 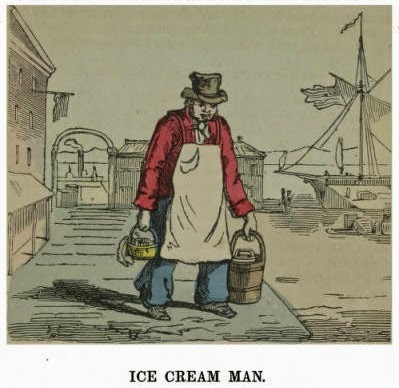 A penny for a scoop of ice cream or sorbet (in Naples), and then the customer would stand by the seller while licking the contents from the glass which would be returned. In his other hand is an old ice cream maker - a sorbetiere. The cream mixture has just been set into the ice in the wooden bucket. National Ice Cream Day is this Sunday, July 20th.